When one talks about seafood and fish in Bodrum Peninsula, Aquarium Restaurant, which İlknur and Cengiz Özbaşaran opened as a family business in 1992 at ancient Myndos (Gümüşlük), one of the most beautiful villages of Bodrum Peninsula, immediately comes to minds of people. The number of their guests, increasing from the first day on, eventually turned into a great Aquarium family. Since 2008, with the support and encouragement they received from the clients and friends, Ozbaşaran Family opened Yalıkavak Aquarium Restaurant, which expands over 2 acres land right on the seaside, having its own pier and located next to Yalıkavak Marina. 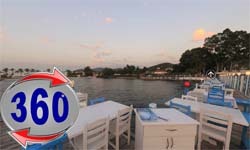 At the beginning of year 2011, Ozbaşaran family also opened Aquarium Bodrum, situated facing to Bodrum Milta Marina. After the arrival of these two new restaurants, Ozbaşaran family’s two sons, Can and Cansın, also participated in their family business. Often praised by national and international press and frequently visited by famous figures of world, Ozbaşaran family try hard to keep their line. At Aquarium restaurants, after your delicious meal, you will have the pleasure of tasting the traditional Turkish coffee, served with bougainvillea flowers, Turkish delight and candles. If you ever come to Bodrum Region, Ozbasaran family would be delighted to welcome you at the romantic atmosphere of one of their Aquarium Restaurants. Yalıkavak Aquarium was established in 2008, just next to Yalıkavak Marina, under the shade of 100 years old eucalyptus trees in 1.5 acres property. Serving all year round, Aquarium Yalıkavak has 150 seats capacity for its indoor section, while seating capacity rises to 350 people during the spring and summer months. Situated at the seaside, Yalıkavak Aquarium with its great seating capacity is most convenient and beautiful location for special events and private parties. Restaurant’s 60 meters long private pier is used as part of their serving area at night, but during the daytime, it is used as sun bathing, swimming, and boat mooring area. For clients desiring to swim, Yalıkavak Aquarium also offers swimming possibilities. They also use hundred years old oven, situated in the gardens, for baking their own bread and for cooking some of the Aquarium specialties such as fish tandoori and fish stew.